The Han Solo movie is slowly but surely pulling back the curtain. We’ve had the synopsis, we’ve had the countless Ron Howard sneak peeks, and now Disney have finally given some lucky, lucky members of the public a brief glimpse of footage. One person in particular has shared their thoughts – and they’re very impressed. “I must say, I’m really really overwhelmed at how freaggin [sic] good it looks,” shares Holger Flick on Facebook (see the full post below) after seeing a reel from the movie during a Disney preview event in Munich. Herr Flick wasn’t done there though. He has kind words to say about the “amazing” work of Alden Ehrenreich as Han Solo, as well as Donald Glover’s Lando Calrissian. Emilia Clarke and Woody Harrelson also look “amazing”, according to the moviegoer. The most interesting thing for Star Wars fans – especially those burned by Star Wars: The Last Jedi – is that the movie apparently has an “old Star Wars feel to it.” By old, I’m guessing he means more original Star Wars and less Phantom Menace which, lest we forget, is somehow nearing its 20th (!) anniversary. Flick also makes explicit reference to it being a “fan-service movie” for some of the older Star Wars fans. So far, so good. All being told, it’s actually pretty nice to see some early positive reactions. Maybe hold fire on going OTT on this one, though: a single response at an event like this isn’t the most definitive litmus test, but it’s promising if nothing else. The Han Solo movie has been plagued by problems from the outset; for Ron Howard to have salvaged that and go on to produce something that could get tongues wagging like this straight away can only be a good sign. After all, no one wants the movie to fail – and it has all the ingredients to be a sure-fire hit. Need more Han Solo in your life? 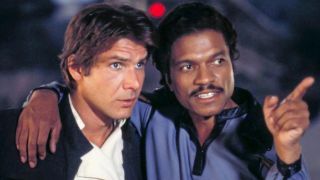 Then you need to look at the 30 best Han Solo moments, as well as why the Han Solo movie is like a gangster movie, according to cast member Paul Bettany.